Brazil soccer, or Brazil football as the rest of the world outside of the United States would call it, is an amazing thing to behold. It's more than just a sport and a team, for Brazilians it's really like a second religion. It's taken very seriously and there are always huge expectations. Here are the top 5 reasons why Brazil football is like a second religion to its fans. 1. 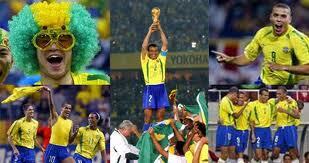 The History: Brazilian football has a greater history in global competition than any other country in the world. They have won so much, so often, and they have fielded some of the best teams ever to take the pitch and compete. With such a great history and so many championships, World Cups and so on, there is a great tradition and rabid, fervent fans. 2. The Style: Brazil soccer isn't workmanlike or ugly to watch, it's The Beautiful Game. They aren't just a soccer team, they are the Samba Kings. They play the game unlike any other team or country out there, and style and aesthetics are almost as important as winning. 3. The Players: The list of great players to suit up for the Brazil football team is legendary. Going back to Pele and all of the greats of the past, to the dynamic players of more recent times like Ronaldo, Ronaldinho, Kaka and on down the line from there, the players are fantastic and some of the best to play the game, period. 4. It's the Top Priority: In many countries throughout the world, many different sports are very popular. However, in Brazil, soccer is at the top of the list and nothing else even comes close. Because of that, all of the games and all of the matches take on extra meaning and significance, and any given game turns into a crucial performance and a must-win. 5. The Competition: People take Brazilian football so seriously in part because of the competition and all of their rivals. They don't want to be outdone by the likes of Argentina in South America, and they don't want to lose out to other powers like Portugal, Spain or England when they play in the World Cup. Playing and defeating their rivals is hugely important and those tough competitors makes it all the more exciting. As you can see, there are many different reasons why Brazil soccer is like a second religion. The amazing track record and history of the club, all of their great players and their famous Samba Kings style, it all adds up to one of the best teams out there and an extremely diehard group of fans.